Despite Thomas’ protestation, Alby has Teresa brought to jail for triggering the changes. Thomas tries to defend her but Alby says that he’s lucky he’s not thrown in the Slammer with her. As Alby calls for two guards to take her away, she telepathically thinks to Thomas that he should come see her. He tries to respond with telepathy but she doesn’t respond. Here again, Alby’s sexism reveals itself when he blames Teresa for triggering something she had no control over. Alby’s accusation is comparable to when sexist men blame women for being raped because the way they dress or act “triggers” men’s sexual desire. All over the Glade people are trying to seal the Doors in order to prevent the Grievers from getting inside. Thomas thinks that everyone is working hard so that they can keep from panicking. Thomas goes to see Newt and convinces him that Teresa is innocent. Newt says that if they can survive the night, then he’ll consider having Teresa freed from the jail. Before leaving, Thomas suggests that maybe he and Teresa were sent to the Glade to help find an exit. Thomas’ realization that work keeps people from panicking shows that he has internalized Newt’s philosophy about the value of work for maintaining order. Thomas visits Teresa in the jail. She tells him that she’s afraid of the Grievers. Thomas says that she’s never heard that the Gladers called them that before. He says that she she must remember more than she realizes or else overheard people talking about the Grievers while she was still in a coma. Thomas soothes her worries by promising to get her out of the jail tomorrow. He then heads back to help the rest of the Gladers defend his new home in the Glade. If Teresa can recall the name of the Grievers, then perhaps Thomas can also recover his memories to help find an exit to the Maze. By uncovering his memories, Thomas can come one step closer to learning the truth about himself and his world. Plaue, Ethan. "The Maze Runner Chapter 37." LitCharts. LitCharts LLC, 22 Jul 2015. Web. 22 Apr 2019. Plaue, Ethan. "The Maze Runner Chapter 37." LitCharts LLC, July 22, 2015. 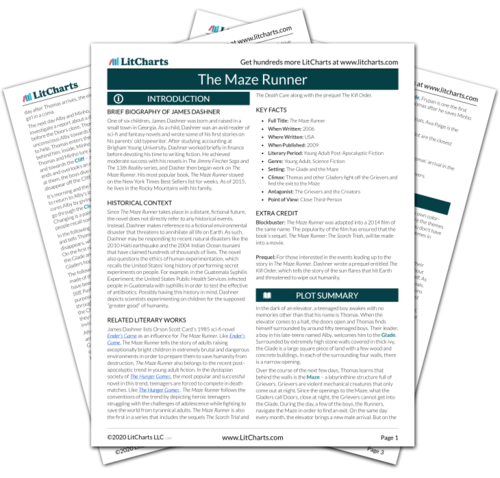 Retrieved April 22, 2019. https://www.litcharts.com/lit/the-maze-runner/chapter-37.